Mary Wickentower takes over at LEA 6 for the SEPTEMBER ROUND of the LEA FULL SIM ART SERIES (here for full year schedule), with the one of its kind "CINEMA!" Take Back the Ambience. Mary Wickentower, of "Polished Puppet Productions" presents "Cinema! ",the latest of the LEA FULL SIM ART Series. Mark your calendar for Monday 4PM SLT, 3rd September 2012, when the melodic voice of Antonio Galloway, in the style of Frank Sinatra, Dean Martin, and Elvis Presley will lead in the grand opening ceremonies for "Cinema!". "Cinema!" will run for the month of September. Take a trip down memory lane and take back the ambiance of an earlier time - a time of elegance, when going to the cinema was luxurious, and the theatres were grand places, huge and ornate with immense balconies, high domed ceilings, massive red carpeted staircases and décor that rivaled the Vatican. Their equally impressive facades dominated that landscape. Even the cozy, smaller theatres had a rich character, where you could ease back in splendid surroundings and suspend all worries, leave you tribulations behind and enter a world of imagination. And then there was the drive in movie - a culture all to itself. The mammoth screen filled the sky, and you could hunker down with friends or family, cuddle in a fluffy blanket, bury your head in a soft pillow, all in the comfort of your own car. The real life movie cinemas of today are colorless and sterile places, much like the work cubical that we spend our lives in, They leaves us hungering for a touch of class, a bit of chic. Come take back the ambiance. But there's more. Each of the spectacular theatres featured in "Cinema!" 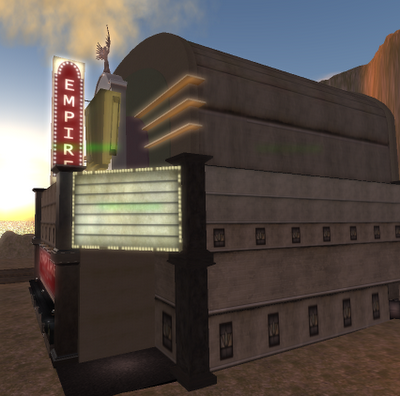 also showcases films from the best machinima in Second Life. Relax in fabulous surroundings and watch films from LEA MOM; the 48 hour Machinima; and the University of Western Australia's MACHINIMUWA contests. The panorama of "Cinema!" also features a cozy home-style dinner and vintage gas station, all set in a 1940-1950's California landscape. Bring a bike, brig a car, bring your honey or best friend and share in the experience of "Cinema!" and take back the ambiance! The impressive Drive-in screen is a generous donation by Ethos Erlanger, "passionate" builder and resident of SL since 9/12/2006. Visit Ethos Erlangeron marketplace or contact him in-world. Mary Wickentower has been a Second Life resident since 2008, located in the snowlands of Sansara, mainland. Mary is a poet/writer songwriter, artist, SL builder and machinimatographer, and owner of Wickentower Art and owner of the film production company, Polished Puppet Productions. "Cinema!" represents a collaboration of some of the finest creators, builders, machinimatographers in Second Life and is a tribute to their amazing talent.